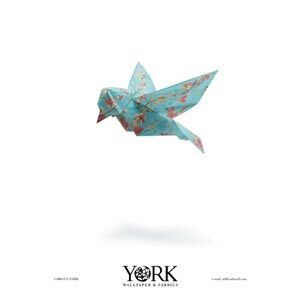 The second of a second series of two advertisements for York Wallpaper & Fabrics. Unfortunately, the wallpaper was a little too springy to fold well, so the final model was folded from white parchment paper, and the wallpaper texture was added by computer. This bird (along with some other figures) was originally designed for another client, but they decided not to use it.